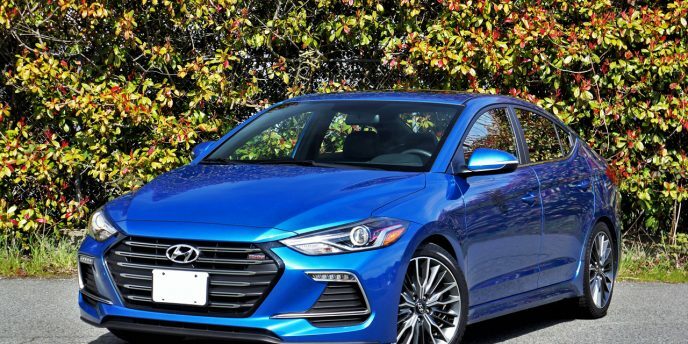 With the Genesis Coupe now long gone, and Genesis itself becoming a standalone luxury brand, this completely redesigned 2019 Veloster becomes the only dedicated sports model in Hyundai’s lineup. That’s a pretty heavy weight for this little front-drive compact to carry, but it continues to walk with a swagger of confidence thanks to truly unique styling that preserves the original model’s unorthodox hatchback shape and its most identifiable feature, the long driver’s door that makes it look like a regular sports coupe from one side, and the extra rear passenger’s side door that allows easier access to the back seats. Yet there’s no way you’ll mistake the Veloster for a compact sedan or even a regular hatchback when one whizzes by, its third door sneakily hiding its handle in the rearmost section of the side glass surround as if doubling as a tiny quarter window, while the car’s general shape is much longer, lower and leaner, and its rear liftback design much more vertical and dramatically styled than the average compact commuter car. Of course, other than providing plenty of room up front and a fairly accommodating rear passenger compartment the Veloster is anything but the compact class average, yet its much more practical design makes it one of the more pragmatic choices amongst compact sports coupes, albeit this list has been dwindling in recent years and now disparate at best with only the Honda Civic Coupe available in three regular trims plus the sportier Si, plus the rear-wheel drive Subaru BRZ and Toyota 86 twins, and finally the soon to be discontinued VW Beetle. Certainly there are other sporty four- and five-door compacts from the legendary VW GTI/Golf R and Subaru WRX/STI to Ford’s Fiesta and Focus ST and RS models, the latter blue ovals already slated for cancellation, while a handful of mainstream volume brands still off larger performance cars, but the days of compact sport coupes seem numbered. Reason enough for the Veloster to break the rules with its three-door body style (or four-door if you include the hatch), but rest assured its underpinnings are comparatively straightforward. It comes standard with a 2.0-litre base four-cylinder engine good for 147 horsepower and 132 lb-ft of torque, which drives the front wheels through a standard six-speed manual or optional six-speed automatic, whereas the Veloster Turbo model in our garage this week is 400 cubic centimetres smaller a just 1.6 litres yet puts out a much more energetic 201 horsepower and 195 lb-ft of torque. It still drives the front wheels through a standard six-speed manual gearbox, but those wanting automation can option up to a quick-shifting seven-speed dual-clutch gearbox with paddle shifters on the steering wheel. Our tester includes the manual as we’d prefer if it were staying with us longer than a week, plus it also gets a $3,000 available Turbo Tech package featuring a powered head-up display system with a Sport mode function, rain-sensing wipers, rear parking sensors, automatic climate control with an auto defogger, a larger 8.0-inch infotainment touchscreen with integrated navigation, eight-speaker Infinity audio with an external amplifier, leather upholstery, and two-way powered driver seat lumbar support. Another $500 provides an upgrade to the Performance package that adds unique 18-inch alloy wheels on 225/40 Michelin Pilot summer-performance tires, while all of the above was added to a Veloster Turbo that already comes standard with LED headlights, LED side mirror turn signal repeaters, LED taillights, a unique grille and extended side sills, proximity-sensing keyless access with pushbutton ignition, a 4.2-inch TFT multi-information display replacing a more conventional 3.5-inch trip computer within the gauge cluster, a powered glass sunroof, silver vent rings, checkered dash trim, partial cloth/leather upholstery with red stitching instead of blue, leatherette door trim, red interior accents, and more. Of course, Turbo trim pulls up plenty of features from the base model mentioned earlier, including auto on/off headlights, LED daytime running lights, power-adjustable heated side mirrors, remote entry, a leather-wrapped heatable multifunction steering wheel, a tilt and telescopic steering column, cruise control, power windows, illuminated vanity mirrors, a sunglasses holder, filtered air conditioning, a one-inch smaller 7.0-inch infotainment touchscreen with standard Apple CarPlay and Android Auto, a rearview camera with dynamic guidelines, six-speaker audio, Bluetooth hands-free phone connectivity with audio streaming, a leather-wrapped shift knob, heated front seats, manual six-way driver and four-way front passenger seat adjustments, blindspot detection with rear cross-traffic alert, all the expected active and passive safety features, plus more. 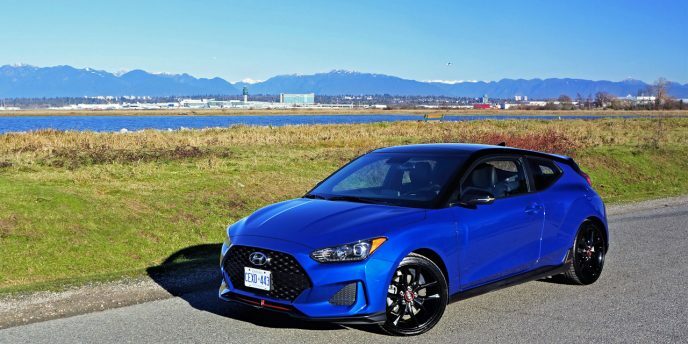 Before moving on from trims and features, Hyundai now offers the even more capable Veloster N for 2019, boasting a 2.0-litre turbocharged four-cylinder good for a meaty 275 horsepower and 260 lb-ft of torque. It comes standard with a six-speed manual transmission featuring downshift rev-matching, an electronically controlled limited slip differential for getting power down to the road, an electronically controlled suspension attached to unique 19-inch alloy wheels on 235/35 Pirelli summer-performance tires for maximizing lateral grip, Normal, Sport, N and Custom drive mode selections, a driver-adjustable active exhaust system, and more. This $34,999 model gets unique styling details including some red paintwork along its lower extremities and the option of Chalk White, Phantom Black and exclusive Performance Blue (more of a baby blue) exterior colours, plus inside it features blue-stitched N exclusive cloth sport seats and other upgrades. Base Veloster and Veloster Turbo trims are much more affordable, the former starting at just $20,999 plus freight and fees, and the latter for only $25,899. You can add the conventional automatic to the base model for another $1,300, whereas the more performance-oriented dual-clutch automated gearbox ups the Turbo’s price by $1,500. This meant my almost fully featured test model came to $29,399, just shy of a fully loaded Veloster Turbo Tech DCT’s $30,399 list price. To get full 2019 Veloster pricing details include models, trims and options, not to mention detailed rebate info and dealer invoice pricing that could save you thousands, make sure to check out CarCostCanada. 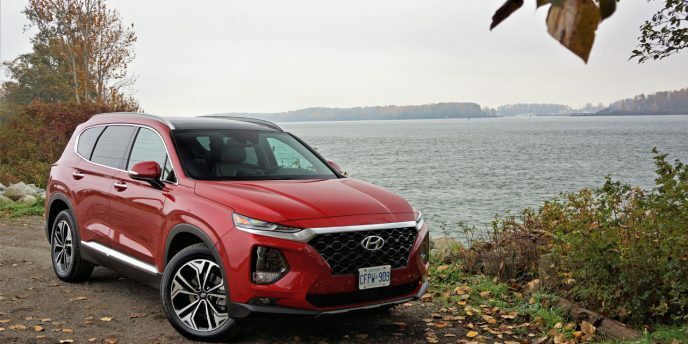 The Santa Fe is one of the crossover SUV sector’s most popular entries, and it’s entirely new for 2019. We’ve got it in our garage this week, and without saying too much we’re impressed. First off, let’s clear up some confusion. The Santa Fe started life as more of a compact SUV than anything truly mid-size, but like so many other vehicles it has grown over the generations to the point that it now leans more towards mid-size than compact. Despite coming close to matching the length, width and height of a five-passenger mainstays like the Ford Edge, some industry insiders still call it compact and therefore muddle the marketplace, so I’m here setting the record straight. To be even more specific, at 4,770 millimetres (187.8 inches) long and 1,890 mm (74.4 in) wide the 2019 Santa Fe we’re testing here is a considerable 246 mm (9.7 in) longer than the current Ford Escape compact SUV yet only a fractional 9 mm (0.3 in) shorter than the Edge, while it’s 52 mm (2.0 in) wider than the former and only 38 mm (1.5 in) narrower than the latter. To be fair, the new Santa Fe is actually a full 70 mm (2.7 in) longer and 10 mm (0.4 in) wider than the outgoing model, this improving interior roominess. So while I’ve long considered the Santa Fe a mid-size crossover SUV, now we can all safely categorize as such and call it a day. This becomes even clearer when factoring the size of the three-row Santa Fe XL, which I’ll cover in a future review. This being a Garage piece, I won’t go into too much detail about the Santa Fe’s interior quality, fit, finish, styling, etcetera, or my experiences behind the wheel. Anyone who has read my reviews of previous Santa Fe Sport models, the vehicle this model replaces, will know I was a fan, so suffice to say this one is better in every respect. I’ll leave it there for now. Like the outgoing model this new one uses the same powertrains, although both receive new variable valve timing for improved response and fuel economy. The base engine remains the well-proven 2.4-litre four-cylinder making 185 horsepower and 178 lb-ft of torque, while the top-line turbocharged 2.0-litre four increase power to 235 and torque to 260 lb-ft. Astute readers will notice the upgraded engine is down 5 horsepower, and patient readers will come back to find out if that’s noticeable when I cover it in my review. For now, take solace that the outgoing Santa Fe Sport’s six-speed automatic has been replaced by a much more advanced eight-speed auto with standard auto start/stop that shuts the engine off when it would otherwise be idling to reduce emissions and save fuel. Fuel economy is therefore improved over the outgoing model, with the 2.4 FWD base model now rated at 10.7 L/100km in the city, 8.2 on the highway and 9.6 combined compared to the old model’s respective 11.1 city, 8.6 highway and 10.0 combined; the same engine with AWD now capable of a claimed 11.2 city, 8.7 highway and 10.1 combined compared to 12.0, 9.1 and 10.7 respectively with last year’s Santa Fe 2.4 AWD; and finally 12.3 city, 9.8 highway and 11.2 combined for the 2.0-litre turbo instead of 12.5, 9.6 and 11.2 when compared to the same engine in the previous generation. Yes, a bit surprising that the new eight-speed auto and auto start/stop system resulted in zero combined fuel economy improvement with the turbo, but when factoring in that most mileage is done in the city then it can be seen as a positive. Some other changes worth mentioning here in this Garage story include new trim lines, starting with the base Essential, and then upgraded with Preferred, Preferred Turbo, Luxury, and finally the as-tested Ultimate I’m driving this week. First, kudos to Hyundai for ditching the name “Limited” for a trim line they’d sell as many as they could if consumers would buy them, and more praise for not following the status quo and naming their top-line model “Platinum”. I like the name Essential for a base model, especially one that includes standard heatable front seats and a standard heated steering wheel, not to mention 7.0-inch touchscreen infotainment with Apple CarPlay and Android Auto smartphone integration, a backup camera, dual USB charge ports, Bluetooth, illuminated vanity mirrors, auto on/off projector headlights with LED accents, fog lamps, 17-inch alloy wheels, chrome and body-colour exterior detailing, a leather-wrapped steering wheel and shift knob, two-way powered driver’s lumbar support, 60/40 split folding rear seatbacks with recline, electromechanical parking brake with auto hold, Drive Mode Select with Comfort, Smart, and Sport modes, and much more for just $28,999 plus freight and fees (go to CarCostCanada for detailed pricing, plus rebate info and dealer invoice pricing that could save you thousands). Ante up $30,199 and you’ll get Hyundai’s suite of SmartSense advanced driver assistive systems including auto high beam assist, adaptive cruise control with stop-and-go, forward collision alert and mitigation with pedestrian detection, lane keeping assist, and Driver Attention Warning. All-wheel drive costs $2,000 with Essential trim or comes standard with Preferred trim, at which point the SmartSense package is included as well, plus blindspot detection, rear cross-traffic alert with collision avoidance, a rear occupant alert system that remembers if you opened a rear door prior to driving and then reminds that someone or something may still be in back when exiting, and finally safe exit assist that warns of traffic at your side when opening your door, for a total of $35,099. Additional Preferred features include 18-inch alloy wheels, turn signals added to the side mirror housings, proximity keyless access with pushbutton ignition, an auto-dimming rearview mirror, rear parking sensors, a Homelink garage door opener, dual-zone automatic climate control with a CleanAir Ionizer, Predictive Logic and auto defog, BlueLink smartphone telematics, satellite radio, an eight-way powered driver’s seat, rear fore and aft sliding seats, and more. The 2.4-litre base engine is still standard in Preferred trim, but the turbocharged 2.0-litre engine is now a $2,000 option. Moving up to $41,899 Luxury trim adds the turbo engine and AWD as standard, plus dark chrome exterior door handles, door scuff plates, LED interior lighting, a 7.0-inch TFT LCD multi-information display within the primary instrument cluster, a powered panoramic sunroof, a 360-degree Surround View parking camera, a deluxe cloth roofliner, leather console moulding, memory, four-way powered lumbar support and an extendable lower cushion for the driver’s seat, an eight-way powered front passenger’s seat, perforated leather upholstery, ventilated front seats, heatable rear seats, rear side window sunshades, a proximity actuated smart liftgate, and more. My $44,999 Ultimate trimmed tester included most everything from Luxury trim plus 19-inch alloys, satin exterior trim and door handles, LED headlights, LED fog lamps, LED taillights, rain-sensing wipers, a head-up display that projects key info onto the windscreen ahead of the driver, larger 8.0-inch touchscreen infotainment with navigation and traffic flow including incident data via HD radio, 12-speaker 630-watt Infinity audio with QuantumLogic Surround sound and Clari-Fi music restoration technology, a wireless charging pad, and more. The five-seat Santa Fe boasts interior volume of 4,151 litres (146.6 cubic feet) and cargo capacity measuring 1,016 litres (35.9 cubic feet) behind the second row and 2,019 litres (71.3 cubic feet) with the rear seatback laid flat, a process that is made easier via powered release buttons on the cargo wall. Hyundai introduced its redesigned 2017 Elantra sedan so early last year that I'm having trouble thinking of this latest test car as a 2017 model, but so it is. 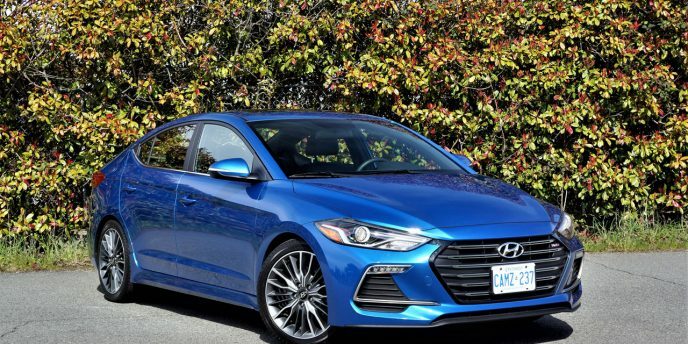 Truly, by the time the 2018 model rolls around later this year the Elantra Limited that went to press on March 29, 2016 will be more than a year and a half old, but we're really only talking numbers. Still, the 2017 Elantra Sport I tested more recently feels like an entirely different car than the Limited from before. Unlike so many performance pretenders, the "Sport" moniker on this special Elantra sedan's rear trunk lid does more than denote stylish body cladding, larger alloys and racier interior trim with sporty red accents, but rather includes all of the above-done very tastefully I might add-while signifying a completely reworked powertrain and suspension package for a car that really lives up to its name. With Q1 behind us we probably shouldn’t forecast 2017 as the year of the car’s return, as SUV growth is still at unprecedented rates, but some models give the future of ground-hugging models hope. After hovering around the 65k mark for the past half decade Honda’s Civic once again shows that the market for cars is ripe if you build something people want to buy (consider that thought for a moment Dodge), the ever-growing compact finding 7,251 buyers so far this year and 64,552 during calendar year 2016, while Toyota’s new Corolla family (it now includes the orphaned Scion iM in its ranks) was good for 5,996 deliveries over the first three months of 2017 and 48,195 last year. High technology is rapidly shaping the automobile industry's present and future. Where there were powerful V8 engines, some have been replaced with turbocharged six- and even four-cylinder powerplants. The result has been V8 horsepower numbers with smaller, fuel-saving engines. One automaker's bet that hydrogen will power future vehicles is hedged by another manufacturer's commitment to electric power. Be it smaller displacement engines or alternative propulsion, the Earth will run dry of fossil fuels someday, so manufacturers are prepping for the future. 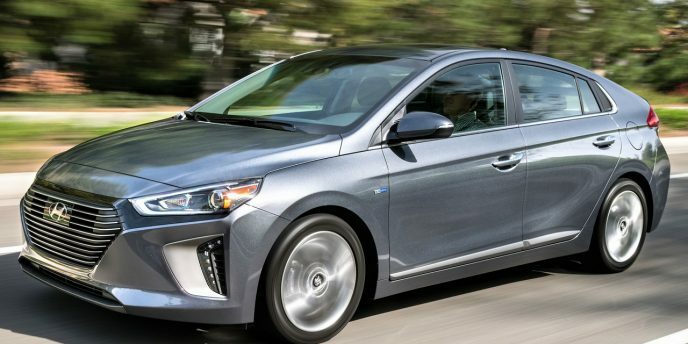 For 2017, through the all-new Ioniq (rhymes with 'bionic'), Hyundai launches the world's first dedicated vehicle platform with three electrified low- and zero-emission powertrain choices.